But how are you going to compare them for similarity? You’ll need a distance function to handle that. But which one? How you choose? And how do you compare histograms using Python and OpenCV? In this blog post I’ll show you three different ways to compare histograms using Python and OpenCV, including the cv2.compareHist function. By the end of this post you’ll be comparing histograms like a pro. 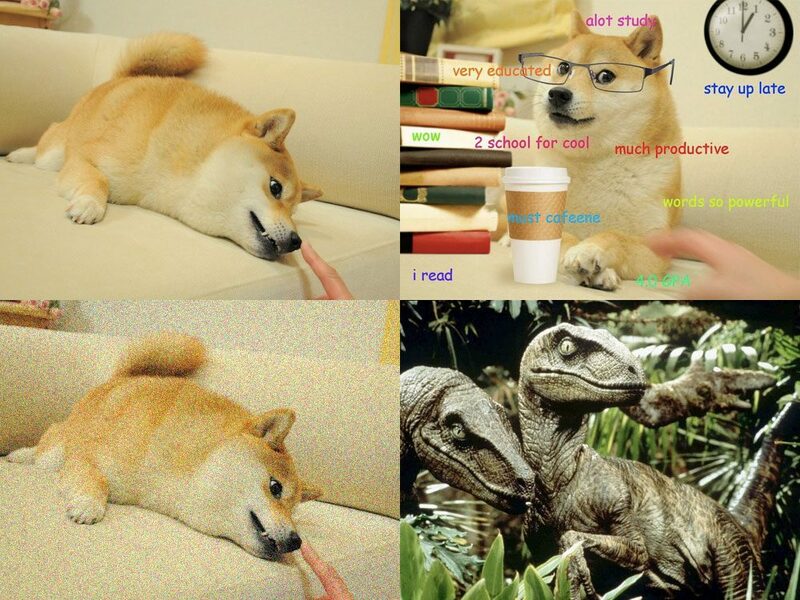 Figure 1: Our test dataset of four images — two images of Doge, another with Gaussian noise added, and velociraptors, for good measure. Our example dataset consists of four images: two Doge memes, a third Doge image, but this time with added Gaussian noise, thus distorting the image, and then, velociraptors. Because I honestly can’t do a blog post without including Jurassic Park. We’ll be using the top-left image as our “query” image in these examples. We’ll take this image and then rank our dataset for the most “similar” images, according to our histogram distance function. Ideally, the Doge images would appear in the top three results, indicating that they are more “similar” to the query, with the photo of the raptors placed at the bottom, since it is least semantically relevant. However, as we’ll find out, the addition of Gaussian noise to the bottom-left Doge image can throw off our histogram comparison methods. Choosing which histogram comparison function to use is normally dependent on (1) the size of the dataset (2) as well as quality of the images in your dataset — you’ll definitely want to perform some experiments and explore different distance functions to get a feel for what metric will work best for your application. With all that said, let’s have Doge teach us about comparing histograms. Much histogram. Wow. I OpenCV. A lot computer vision, indeed. The first thing we are going to do is import our necessary packages on Lines 2-7. The distance sub-package of SciPy contains implementations of many distance functions, so we’ll import it with an alias of dist to make our code more clean. We’ll also be using matplotlib to display our results, NumPy for some numerical processing, argparse to parse command line arguments, glob to grab the paths to our image dataset, and cv2 for our OpenCV bindings. Then, Lines 10-13 handle parsing our command line arguments. We only need a single switch, --dataset, which is the path to the directory containing our image dataset. Finally, on Lines 18 and 19, we initialize two dictionaries. The first is index, which stores our color histograms extracted from our dataset, with the filename (assumed to be unique) as the key, and the histogram as the value. The second dictionary is images, which stores the actual images themselves. We’ll make use of this dictionary when displaying our comparison results. First, we utilize glob to grab our image paths and start looping over them on Line 22. Then, we extract the filename from the path, load the image, and then store the image in our images dictionary on Lines 25-27. Remember, by default, OpenCV stores images in BGR format rather than RGB. However, we’ll be using matplotlib to display our results, and matplotlib assumes the image is in RGB format. To remedy this, a simple call to cv2.cvtColor is made on Line 27 to convert the image from BGR to RGB. Computing the color histogram is handled on Line 32. We’ll be extracting a 3D RGB color histogram with 8 bins per channel, yielding a 512-dim feature vector once flattened. The histogram is normalized on Line 34 and finally stored in our index dictionary on Line 35. For more details on the cv2.calcHist function, definitely take a look at my guide to utilizing color histograms for computer vision and image search engines post. Now that we have computed histograms for each of our images, let’s try to compare them. The cv2.compareHist function takes three arguments: H1, which is the first histogram to be compared, H2, the second histogram to be compared, and method, which is a flag indicating which comparison method should be performed. cv2.HISTCMP_CORREL: Computes the correlation between the two histograms. cv2.HISTCMP_CHISQR: Applies the Chi-Squared distance to the histograms. cv2.HISTCMP_INTERSECT: Calculates the intersection between two histograms. cv2.HISTCMP_BHATTACHARYYA: Bhattacharyya distance, used to measure the “overlap” between the two histograms. Lines 37-43 define our tuple of OpenCV histogram comparison methods. We’ll be exploring the Correlation, Chi-Squared, Intersection, and Hellinger/Bhattacharyya methods. We start looping over these methods on Line 46. Then, we define our results dictionary on Line 49, using the filename of the image as the key and its similarity score as the value. I would like to draw special attention to Lines 50-55. We start by initializing a reverse variable to False. This variable handles how sorting the results dictionary will be performed. For some similarity functions a LARGER value indicates higher similarity (Correlation and Intersection). And for others, a SMALLER value indicates higher similarity (Chi-Squared and Hellinger). Thus, we need to make a check on Line 54. If our distance method is Correlation or Intersection, our results should be sorted in reverse order. We start by looping over our index dictionary on Line 58. Then we compare the color histogram to our Doge query image (see the top-left image in Figure 1 above) to the current color histogram in the index dictionary on Line 61. The results dictionary is then updated with the distance value. Finally, we sort our results in the appropriate order on Line 65. We start off by creating our query figure on Lines 68-71. This figure simply displays our Doge query image for reference purposes. Then, we create a figure for each of our OpenCV histogram comparison methods on Line 74-83. This code is fairly self-explanatory. All we are doing is looping over the results on Line 78 and adding the image associated with the current result to our figure on Line 82. Finally, Line 86 then displays our figures. Figure 2: Comparing histograms using OpenCV, Python, and the cv2.compareHist function. The image on the left is our original Doge query. The figures on the right contain our results, ranked using the Correlation, Chi-Squared, Intersection, and Hellinger distances, respectively. For each distance metric, our the original Doge image is placed in the #1 result position — this makes sense because we are using an image already in our dataset as a query. We expect this image to be in the #1 result position since the image is identical to itself. If this image was not in the #1 result position, then we would know there is likely a bug somewhere in our code! We then see the Doge school meme is in the second result position for all distance metrics. However, adding Gaussian noise to the original Doge image can hurt performance. The Chi-Squared distance seems especially sensitive. Does this mean that the Chi-Squared metric should not be used? In reality, the similarity function you use is entirely dependent on your dataset and what the goals of your application. You will need to run some experiments to determine the optimally performing metric. Next up, let’s explore some SciPy distance functions. The main difference between using SciPy distance functions and OpenCV methods is that the methods in OpenCV are histogram specific. This is not the case for SciPy, which implements much more general distance functions. However, they are still important to note and you can likely make use of them in your own applications. On Lines 91-94 we define tuples containing the SciPy distance functions we are going to explore. Specifically, we’ll be using the Euclidean distance, Manhattan (also called City block) distance, and the Chebyshev distance. From there, our code is pretty much identical to the OpenCV example above. We loop over the distance functions on Line 97, perform the ranking on Lines 101-109, and then present the results using matplotlib on Lines 111-130. Figure 3: Comparing histograms using the built-in SciPy distance metrics. And you may be thinking, hey, isn’t the Chi-Squared distance already implemented in OpenCV? But the OpenCV implementation only takes the squared difference of each individual bin, divided by the bin count for the first histogram. In my implementation, I take the squared difference of each bin count, divided by the sum of the bin count values, implying that large differences in the bins should contribute less weight. This code should start to feel pretty standard now. We loop over the index and rank the results on Lines 145-153. Then we present the results on Lines 155-174. Figure 4: Applying my custom Chi-Squared function to compare histograms. Take a second to compare Figure 4 to Figure 2 above. 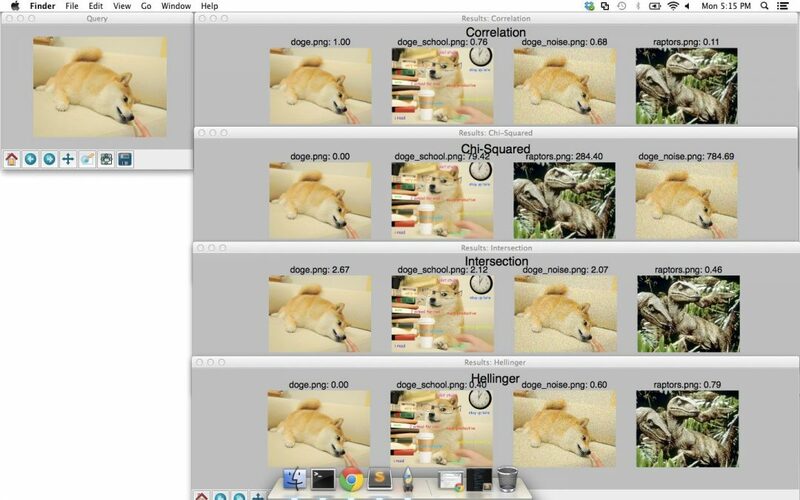 Specifically, examine the OpenCV Chi-Squared results versus my custom Chi-Squared function — the Doge image with noise added is now in the third result position rather than the fourth. Does this mean you should use my implementation over the OpenCV one? In reality, my implementation will be much slower than the OpenCV one, simply because OpenCV is compiled C/C++ code, which will be faster than Python. But if you need to roll-your-own distance function, this is the best way to go. Just make sure that you take the time to perform some experiments and see which distance function is right for your application. In this blog post I showed you three ways to compare histograms using Python and OpenCV. The first way is to use the built in cv2.compareHist function of OpenCV. The benefits of this function is that it’s extremely fast. Remember, OpenCV is compiled C/C++ code and your performance gains will be very high versus standard, vanilla Python. The second benefit is that this function implements four distance methods that are geared towards comparing histograms, including Correlation, Chi-Squared, Intersection, and Bhattacharyya/Hellinger. However, you are limited by these functions. If you want to customize the distance function, you’ll have to implement your own. The second way to compare histograms using OpenCV and Python is to utilize a distance metric included in the distance sub-package of SciPy. However, if the above two methods aren’t what you are looking for, you’ll have to move onto option three and “roll-your-own” distance function by implementing it by hand. Hopefully this helps you with your histogram comparison needs using OpenCV and Python! Feel free to leave a comment below or shoot me an email if you want to chat more about histogram comparison methods. And be sure to signup for the newsletter below to receive awesome, exclusive content that I don’t publish on this blog! Which is the best way to compare Faces ? any sugesion !!! Hi Ansari, you’ll want to take a look at the Eigenfaces, Fisherfaces, and LBP (Local Binary Patterns) for face recognition family of algorithms. I hope this gets you started! Hi sir, Actually I am trying to compare two faces (one from my database , another from my web cam) , but I couldnt. can u help me with some examples or links ? I have done Facedetection , cropping etc but need to campare two faces . plz give me some nice ideas . Hi Ansari, please see my previous comment: If you want to compare the two faces and see if they face belongs to the same person, you’ll need to read up on the Eigenfaces and Fisherfaces algorithms. You can also compare faces using Local Binary Patterns. Hi Adrian, thanks so much you’ve been a lot of help with our project we are trying to accomplish. What modules do I need to download for this, just opencv and numpy? Anything else? OpenCV, NumPy, SciPy, and matplotlib are the standard stack. I’m new to python, I would like to learn from this.. whats the issue ? Hi Sathish, it sounds like the path to the dataset of images is incorrect. Definitely make sure you are providing the correct path via command line argument (see the top of the code file for an example usage of the script). And if you are on a Windows system, definitely make sure the path separators are correct as well (“/” vs. “\”). Hi Adrian, your tutorial is so good but a same problem is happened to me. In my Windows system, typed the example usage or change the “images” to the route of the images in the cmd window, it always said that the doge.png is wrong. Can you help me? Many thanks! I honestly haven’t used a Windows system in quite some time, but make sure you use the “\” path separator instead of the “/” separator that Unix systems use. This could be why the image is not properly loaded. it would improve the tutorial if you showed the histograms for each of the example images. then it would make more sense that the two doge images are usually rated as farther apart when to the eye they seem close. Good point Jeremy, thanks for the feedback! However, this throws an error about the H1.type not being CV_32F. Looking through your example the only thing that I can see is different is that I have not calculate the historgrams on the fly and instead had to read them from the disk. Is this something obvious that I’m missing? I’ve actually found the issue. When numpy was converting the float arrays it was using float64 instead of float32. Just incase someone else comes across this and has the same problem just cast the values to float32 first e.g. Hope that helps and thanks again for everything. Nice, congrats on figuring out the issue Keith! Hi Keith. Can you explain how to save histogram to disk? There are a number of ways to save a histogram to disk. You can use a CSV file. A JSON file. And the cPickle method works quite well. Which format did you want to use to store your histogram? At first I wanted to save histograms in mysql, but couldn’t find a simple way for this. Also i thought that in OpenCV exist some methods to save/read histograms fast and easy, but i didn’t find anything. If you know any method for sql I’ll be glad to read about it. Now i read about “cPickle method” from your mesage, it is good for me. Thanks for the help! I normally wouldn’t recommend storing raw histograms in a SQL database, but if you really wanted to, you can use cPickle and store pickle’d data in a TEXT or BLOB column. Hi Adrian, great tutorial! Could this method be used for object tracking by comparing histograms of objects in subsequent frames? Is there a way to automatically create ROI’s around he contours of detected images and then use that as your query histogram for each object? Absolutely. Tracking an object based on color and histograms can be done using CamShift. I detail how to use CamShift here. As for “automatically” creating ROIs, you would need to filter your list of contours based on some criteria (i.e., shape, size, etc.) From there, you can extract the histogram form the region and use it as your query. hi adrian, great tutorial. but how i write path on raspberry pi? Please download the source code to this post using the form provided where an example usage of the script is provided. You should also read up on the basics of command line arguments. Hi Adrian, this tutorial really helps me a lot, but on my windows system, I don’t know how to use the Argparse package to load the dataset, could tell me how to do that? Many thanks! I would suggest reading through this tutorial on how to use argparse. I get an error below when I run it. BTW Hellinger and Bhattacharyya are alternative names for the same thing. Hi Adrian, first of all thanks for another useful tutorial. I am building a photobooth using RPi and Python. And I was hoping to reuse your code to do histogram matching (for some colour based photo filters), would you be able to hint me on what should I do after getting the result from 2 compared histograms ? What is the end goal of applying photo filters? Are you trying to compare how “similar” two photos are? Or take some action based on how similar the images are? Adrian, the goal is to use a template image and match its histogram to the new image, a perfect example would be Matlab’s imhistmatch() function. I’m not familiar with MATLAB, so I haven’t used the imhistmatch function before. From what I’ve seen on their documentation page, it looks like it’s performing a color transfer between the images using the CDF of the histograms. I would suggest doing more research in that area. The methods proposed in this blog post are mainly just for comparing the similarity of two images based on their color histograms. Ah, I see. Okay then I will continue with more research. Thank you! Thanks for your useful tutorial. I am doing my master thesis, descriptors of images have been given to me, and now I am supposed to calculate hellinger distance. But I should do it with C++ and in Qt creator. Maybe do you know source having information like your tutorial but for C++ ? Unfortunately, I do not have any C++ tutorials. But the same principles in this blog post can be applied to C++ as well. The programming language isn’t important, it’s the computer vision concepts that are being used. Thanks for the tutorial! 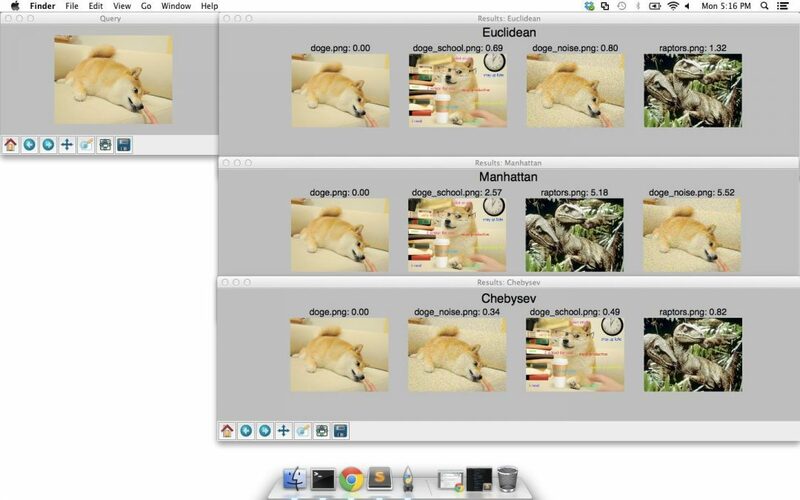 However, in OpenCV the flags for the type of histograme comparison have changed. It is now: cv2.HISTCMP_CORREL, etc. Thanks for sharing Jon. The blog post was intended for OpenCV 2.4; however, as you noted, the flags have changed slightly with OpenCV 3. Please see my reply to “Themba” above for the listing of new flags. Hi Samad — if you’re just getting started working with command line arguments, I really suggest that you read this tutorial first. Can I use it to compare human images more specifically human recognition ? Histograms typically are used for human recognition. Presuming you mean “face recognition”, you would use Eigenfaces, Fisherfaces, or LBPs for face recognition. Which criteria has to be followed to select the best method? Thanks for sharing your knowledge with the world! It’s entirely dependent on your dataset and what you’re trying to build. In nearly all situations I recommend started with the chi-squared distance as this will normally give the best results for comparing histograms. However, you should spot-check all distance methods and see which works best for your project. Its not possible to use the histogram compare method to check a bunch of images to be similar or identical? You always need a MASTER image and compare all other images with this master image? Hmm, I’m not sure I understand your question. But you can certainly compare a bunch of histograms for similarity. You could do this via clustering such as the k-means clustering algorithm. But if you intend to build an image search engine you normally have an input image (your “query image”) that is compared to a database of images. I’ve been trying for hours but I can’t get this line to work. So all I need to do is replace dataset with this file path, right? And –d stays as is? I calculate the histogram like method#1 but the histogram output has rows=-1,cols=-1? Can you explain this, plz? I’m not sure why that would be Julian. What version of OpenCV + Python are you using? Please see my comment to “Willy” above. I have addressed this question earlier. please reply me soon !!!!!!!! I’m not a Windows user, but I think Line 25 should be “\\*” if I’m not mistaken. Hey Adrian i’m interested in textured images, so any ideas about the best method to compare similarities and about the threhold that i should take ? It doesn’t matter if you are comparing color, shape, or texture — what patterns is the type of feature vectors you are producing. If they are histograms, my first suggestion would be the chi-squared distance. It sounds like you are forgetting to supply the command line arguments to the script. You can read more about command line arguments here. You can fix the error by reading my reply to “napi”. You need to read this tutorial on how to use command line arguments. Wow! What an excellent article! Exactly what I was looking for. One thing that I find puzzling is that the perfect score for the Histogram Intersection was 2.67. I totally expected that to be 3.00 (or maybe 1.00). My understanding of the histogram normalization function is that it converts the absolute bins counts to a relative frequency distribution so that all of the bin frequencies for a given histogram together add up to 1.00. Then during the Histogram Intersection, each bin is compared to its corresponding bin in the compared-to histogram with then minimum of the two being accumulated. Since they should be identical the total for each histogram comparison should be 1.00. I am guessing that there are three histograms, one for each channel, which then should produce a score of 3.00. Why would it be 2.67? I just wanted you to make small updates for OpenCV 3.2 because I almost died trying to find this in the documentation. It really depends on the type of object you’re trying to detect. If you can share more information about the object you’re trying to detect, I can attempt to point you in the right direction. Otherwise, you should consider training a HOG + Linear SVM detector. I cover the implementation of the HOG + Linear SVM detector inside the PyImageSearch Gurus course. The above 3 methods are not reliable for signatures. All 3 giving bad results. Are you referring to handwritten signatures? You wouldn’t use histograms to compare handwritten signatures as histograms throw away all spatial information. Nice concept! Thank you for the tutorial. not used.I just need to know the most similar one with its filename (“print results” is enough), and it works fine (compared to small amount images). When compared to big set of files (1000+ image), the memory consumed by python.exe grew rapidly until about 2gig, exception raised. After some googling, it seems opencv 3.0.0 has memory leak issue, but fixed already. Both worked but failed with issue stated upon. So is there a way to reduce or release memory usage in for loop? Tried “Del image”, no way. I’m unaware of any issues related to a memory leak. Can you profile your code and determine if there is a Python variable that is eating up memory? Or if this is internally an OpenCV issue? I am using Python 2.7, is that the base of the issue? Thanks. Please see my reply to “Samad” above. Hi, Adrian, thanks for the great tutorial! I am, however, unsure if it is correct to use flatten() to transform a 3D histogram into a 1D histogram before comparing them. I am working on an algorithm which segments an image using SLIC (thanks again for the SLIC tutorial!) and calculates the histogram for each superpixel. After that, I compare each superpixel to all its neighbors to see if they are similar — if they are similar, I merge them together. However, by using flatten() on two similar superpixels results on two very different histograms! So, [3,3,3] and [2,3,3] are very close on to each other (euclidean distance of 1), but are placed really far away (in positions 63 and 47) by the flatten() method. Thus, I think it is not appropriate to use this approach to compare 3D histograms, but I have no other idea than to revert to calculate 1D histogram per channel and comparing them, which I would like to avoid. What is your opinion on this? Thanks a lot and keep the amazing work! Hey Silas — there are many, many different methods to compare histograms, most of which rely on a distance function/similarity metric of some sort. Typically we would take the 3D histogram, flatten it out, and then compare — the “adjacency” of the bins here doesn’t really matter (unless you wanted to apply earth movers distance) as long as the flattening is consistent. The distance metric will then compare each individual bin. Hey Adrian, Amazing experiment with comparing histograms, I wonder how can we match histograms of an image with respect to a reference image so that we can Normalize other images in the dataset with respect to the same reference image. Is there a method for it or how can it be done, can we implement something like curve fitting on cumulative histogram so that we can match both ?? Hi, Adrian, thanks for the tutorial! It sounds like you accidentally introduced an indentation error when copying and pasting the code. Make sure you use the “Downloads” section of this post to download the source code. It works. Thank you Adrian. Congrats on doing your final year project. Histograms are actually not the best method for facial recognition. Popular algorithms used are normally Eigenfaces, Fisherfaces, LBPs for face recognition, and deep learning embeddings. I have a tutorial on LBPs to help you get started. Otherwise, I cover face recognition in detail inside the PyImageSearch Gurus course. You need to execute the script from your terminal and supply the command line arguments. If you are new to command line arguments, that’s okay, but you need to read up on them first before you try to execute the script. You just need to open up a terminal, navigate to wherever you downloaded the code, and execute the Python script, ensuring you supply the command line arguments as I do in the post. Don’t execute the script via the Python shell. Execute it via the terminal. You do not need to launch a Python shell. Do u think it is possible to use these histogram comparison methods to measure similarity between two hog descriptors ? Absolutely. A HOG descriptor is simply a sequence of histograms appended to each other. I have two dataset of images ( 2 folders “F1&F2” ), i want to make a cluster for each dataset according to the similarity of the images. After getting those 2 clusters, i want to compare them, get their similarity (similarity clustering). How can i do that efficiently ? Can you please advise me a good method to make it ? Thank you very much for your help, I’m looking forward to hearing from you. First you need to consider how you are quantifying the contents of the images. Are you using color histograms? Texture, such as Haralick texture? Local Binary Patterns? I would suggest taking a look at the PyImageSearch Gurus course where I have over 30+ lessons on feature extraction and even demonstrate how to cluster images based on their visual similarity. I use color histogram. According to the color histogram i make each clusters, but after that i don’t know how to compare those two clusters efficiently (How to perform the similarity clustering), that is my problem. Thanks a lot for helping me. This algorithm with naturally cluster images together based on the similarity of their feature vectors. When using k-means we normally use the euclidean distance as the distance metric. But if i use k-means is it possible to specify the names of the images into the clusters.? What should i get as a result ? How the clusters are suppose to looks like ? Because i saw two of your tutorial about k-means : “OpenCV and Python K-Means Color Clustering” and ” Color Quantization with OpenCV using K-Means Clustering” and the representation of k-means is different (The way you used it). And in my case i don’t know exactly how to apply it. Can you be a bit more specific but what you mean by “specify the names of the images into the clusters”? I typically grab the image paths, sort them, extract features, cluster, and then use the indexes of the data points (since they were sorted by image paths originally) to map them back to the original image paths. This process is covered in detail inside the PyImageSearch Gurus course. Why do you run default normalize on the histograms? This results in sum of histogram value squares to be 1, which distorts the actual histogram shape. I imagine, you’d want to normalize with respect to the L1 norm instead. Hi Sir, I need guidance on How to compare x-ray images for presence / absence of an object. Will it be good to compare Histograms. In fact I want to classify xray images as PASS/FAIL based on presence/absence of an object in the image. Hi sir, I need to sort images of similar types. Like I have some set of images which I had sorted manually with count of 500 images, and even I have thousands of images which are of different types and I need only images similar to the images which I have sorted before. I mean I need only images of that type so what should I do?. I am waiting for your answer. The exact algorithm you would use here is highly dependent on the contents of the images. How are you trying to “sort” your images? What constitutes “similarity”? Similar color? Texture? Some other aspect? I’m working on a facial recognition project. My goal is to be able to tell the difference between a face detected directly on a physical person and a face detected on a photo using the textures. So I want to make sure that this is really the user in person and not the picture of his face. I need your recommendations to know what are the different methods to use. What you’re referring to is called “liveliness detection”. I don’t have any tutorials on liveliness detection but I hope to write a guide on it soon! For anyone trying to get the original implementation to work. I have a gist that I got to work for Python 3.6.6 and cv2 version 3.4.3.